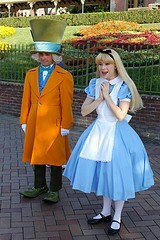 As you all know Jon and I have spent the last week in Disneyland California for the Halloween season. I don't tend to write trip reports for places that we visit fairly frequently, but we experienced so much new stuff on this trip that I had to write one! We had five days of fun and adventures across the resort with many of our Disney friends, including Loren, who you all already know. 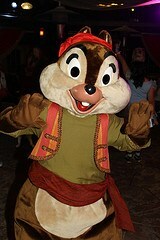 We attended two Mickey's Halloween Parties and the special annual passholder Soundsational event on Wednesday night. This report will of course mainly be about characters, but I will talk about some other stuff along the way if it has specific relevence. 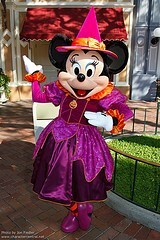 Disneyland has a relatively small programme of events for the Halloween season, but we enjoyed it nonetheless. On Main Street USA Mickey, Minnie, Donald, Pluto, Goofy, Chip and Dale are out on a daily basis to greet fans in their fans in their Halloween costumes. 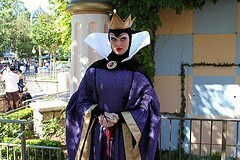 In Fantasyland the villains have a special meet 'n' greet area. 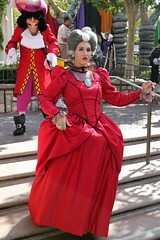 Characters we saw out were Jafar, Cruella, Dr Facilier, Foulfellow, The Queen, The Queen of Hearts, Anastasia, Drizella, Lady Tremaine and Captain Hook. Over in New Orleans Square, Jack Skellington and Sally Stitches stir up some ghoulish fun, while over at Paradise Pier in DCA Duffy waits for someone to visit him at his pumpkin patch. 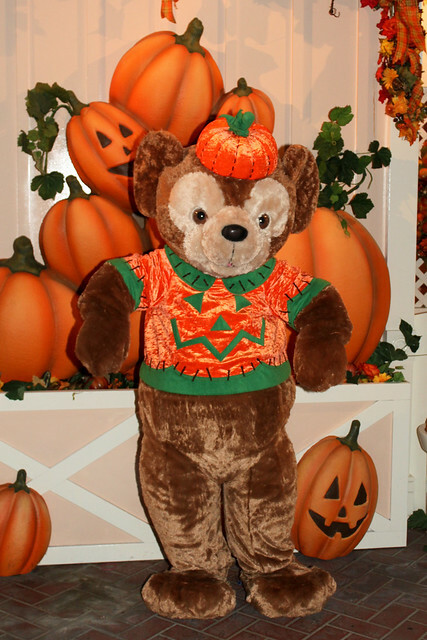 There are also whole lotta pumpkin decorations on Main Street and throughout Frontierland, and of course merchandise and treats are ever present in the stores as with the other resorts. It was neat to see all the amazing carvings that the talented folk at the Big Thunder Ranch can create from the pumpkins, and great to see the characters out in different outfits - and the lines were never too long for them. Two of the best things they offer though are Haunted Mansion Holiday and Space Mountain Ghost Galaxy. I had mixed feelings about HMH at first but after a few rides it grew on me. I liked the narration and thought it was witty and clever, and some of the scenes were very cool indeed. 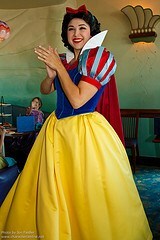 It is amazing how much they transform the attraction to make it basically a whole new ride during the holidays. Space Mountain Ghost Galaxy is interesting, and makes a change from the regular version of the attraction, but isn't anything to write home about. There are some neat projections inside and the on board music is cool, but the ride remains basically the same. I would recommend seeing both if you are visiting. In comparison to Disneyland Paris' daytime offerings, I think they come out about even (I say specifically daytime, as their individual ticketed party offerings are on a different level, and I'll talk about those later). Disneyland Paris features the villains (including some more varied ones than CA), they have some decorations, characters in special costumes, Jack and Sally, special merchandise, and instead of two attractions that have got overlays they have two new daytime Halloween shows. I don't think either parks offerings are better than the other, but it is interesting to note the similarities and differences between them. 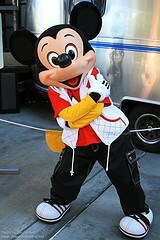 In comparison to Florida, of course California and Paris both win for daytime happenings. 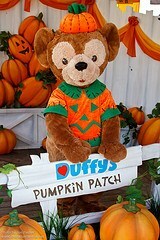 Florida lacks anything at all bar some pumpkins on Main Street. 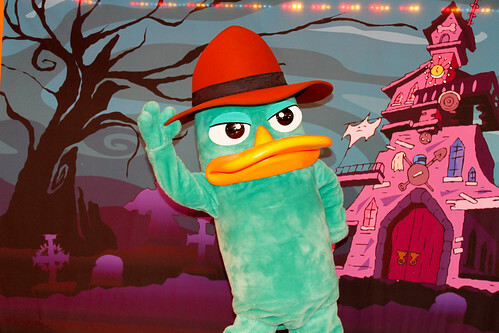 It is really sad that Florida don't offer anything other than the ticketed events, and I hope that in the future they realise that Halloween is actually really popular and maybe having some daytime stuff would be neat. As this report is destined to be quite long I think I'll make a separate one about the parties and AP event, and so now I want to talk about some other random things (character related and not) that we experienced this trip. 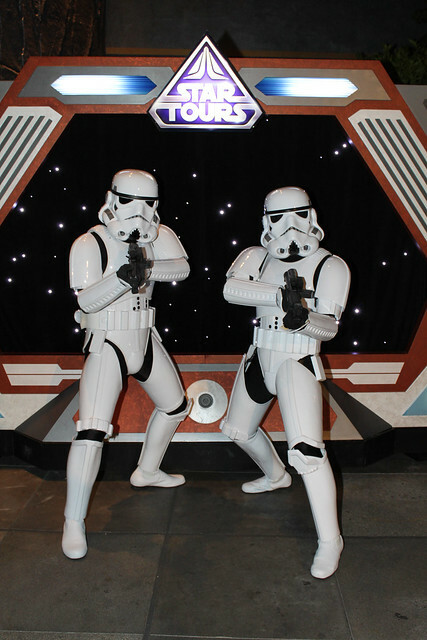 We got to ride Star Tours a few times this trip, and it definitely grew on me. We had rode it for the first time in June and I had had mixed feelings about it, but after riding another three times this trip I definitely think it is very cool, but still retain that it isn't all the hype it was made out to be. On a similar note we also rode The Little Mermaid a few more times following our June trip, and I have to say that although the ending does need improving, again I like it and I look forward to seeing how it might be different or improved once it opens in the Magic Kingdom. 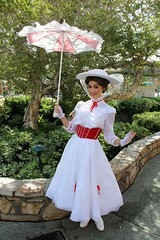 We finally got to see the Mary Poppins and Pearly Band mini-show at the Castle after missing it on previous trips. It isn't anything special, but the musicians are talented and it's good to have these quaint entertainment offerings throughout the parks to bring them more to life. 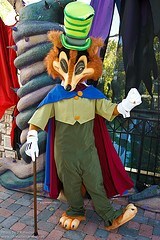 Over at DCA we got to experience four more new character related things there (new for us at least). 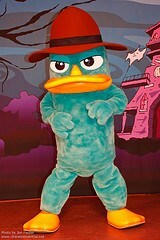 The first was the Phineas and Ferb's Rockin Rollin Dance Party in Paradise Pier. 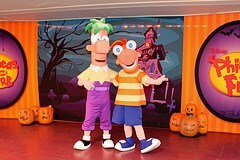 We both thought it was a neat little show and it is good to see both Phineas and Ferb in the park. The show features some of the popular songs from the TV series along with some performers and a DJ atop a car. If you're in DCA be sure to take the time to have the best fourteen and a half minutes of your life (you'd get the joke if you saw it)! 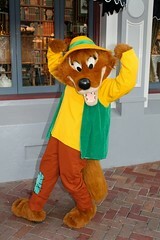 Over at the Redwood Creek Challenge Trail we saw the Wilderness Explorer Graduation Ceremony featuring the lovable Russell from the Disney-PIXAR hit UP. 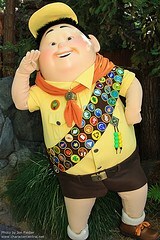 The show isn't too long, and doesn't feature anything special, but it is cute, and a good way to meet Russell (at the end of the show) and pick up a sticker to say you are now a senior Wilderness Explorer. 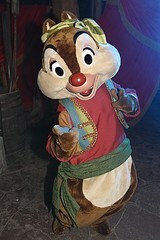 The UP characters have rarely been seen in recent times, so it is definitely good to have this new offering there. 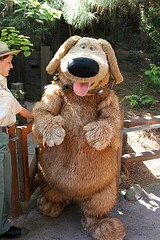 After the show, and as Russell leaves, Dug the talking dog from the same movie comes out to make a short appearance and meet his fans. Since DCA has so much construction going on right now, there hasn't been a day parade for some time, but the park still utilises some of the characters and floats from the parade in the PIXAR Pals shows throughout the day. In June we got to see the Incredibles version, but missed the Monsters one. So this trip we got to see the Monsters one, and much like the Incredibles it isn't anything amazing, is very short, but does feature Boo, Needleman and George Sanderson, all of which are quite uncommon. The fourth and final thing at DCA was Ariel's Grotto. We had eaten at Ariel's Grotto last year to get the World of Color dining package, but for dinner it does not feature characters. So this trip we made a point of going to breakfast at the restaurant. 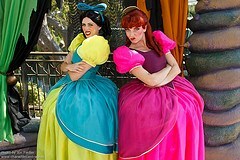 Ariel's Grotto, as you may have guessed, features Ariel and her princess friends. I have never liked the restaurant in terms of it's theming, in fact it is all that was wrong with DCA before they set about putting it right. I can't stand the decor and the expensive dinner food isn't that good, but I have to say breakfast was enjoyable. 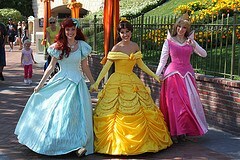 We got to meet Ariel, Belle, Aurora, Cinderella and Snow White. The food is served family style (kinda like a buffet, but served at your table) and includes fruit, pastries, eggs, bacon, sausages, hams and cheeses. I wouldn't rush back, simply because the place needs rebuilding, but if you have a keen princess fan in your family, the food is good and the characters fun. Moving on now to some non-character related things, and we start with ElecTRONica. We didn't get too much time to see the actual entertainment offerings at the nighttime event, but we did get a good overall feel for it, and I have to say it is kinda neat. The lighting and music is good and the performers are interesting to watch. If you liked the movie, or like techno/disco/punky things then you have to check it out. As everyone is well aware, there is a massive improvement programme going on at the moment in DCA which means that Sunshine Plaza no longer exists, and Cars Land is being constructed. In the place of Sunshine Plaza will be Buena Vista Street, which harks back to Walt's early years in Hollywood. 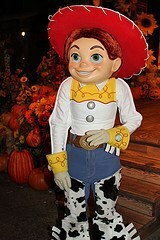 But for now you have to go through a temporary backstage area and end up in Condor Flats to enter the park. Cars Land just looks enourmous and is really starting to take shape with more and more details becoming visible. Areas already complete since our June trip include Goofy's Sky School and the few small stores along the walkway from it, and the new Boardwalk Pizza and Pasta and Paradise Garden Grill restaurants. The new theming in these areas is far superior to the previous incarnations, and really makes you feel like you are somewhere different now. For the first time we also saw Disneyland's Remember... Dreams Come True Fireworks. Since we started making regular visits in 2009, whenever we visited Disneyland, they were presenting their Magical fireworks, and so we would miss the Remember fireworks. I have to say that we really like Remember, more so than we do Magical, even though Magical does feature Dumbo (Remember does not). Remember features Tinker Bell (as does Magical) in the skies above the park, and she seems to get a bit more time in the air, allowing us to get better pictures of her. I hope that Disneyland continue these fireworks, or if they do happen to alter them, they add in Dumbo, which would make Remember the simply best fireworks ever. We made a whistle stop tour through Downtown Disney this time and although it is much the same, there is one new (well, since last year in any case) store that is worth a mention. D Street is the main Vinylmation store of the resort, and features pretty much every range in current circulation. 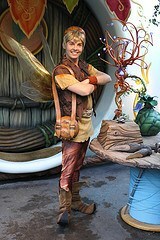 I liked the store, and thought it combined a new upbeat street atmosphere with classic Disney magic. We had been wanting to try the new Trader Sam's bar at the Disneyland Hotel since it opened earlier this year, and this trip presented that opportunity. The best way to describe it is imagine the Jungle Cruise meets the Enchanted Tiki Room and a cocktail bar, then you might be on the right track. It is a unique fusion of all these things, and much more. 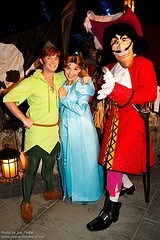 The atmosphere, the drinks and the cast are all wonderful and make for a truly magical, fun and humorous time. There are some hidden surprises in the small bar, and I won't spoil the surprise, but it is one of the best unique additions to the Resort we have seen in a long time. Finally, I don't like to complain here on the blog all too often, though sometimes I do have constructive criticism, but for all the positive things I talked about above, this time there are a couple of "bad" points that I just wanted to mention. I often see on forums around the internet, people complaining about the guests at Disneyland Paris, and a lot of the time I agree. Some European guests are extremely rude, but the other parks are certainly not immune, and on this trip, California was up there with Paris. We had a couple of encounters with some very aggressive people this trip. I point this out, because I am always quick to defend unwarranted criticism of DLP, as a lot of the time people fail to see that the other parks to suffer from the same problems too - Paris is not alone, so please stop making it sound bad all the time! My final point is also a similar thing, but to do with garbage and smells. Again, many people on the Internet seem to complain a lot about Paris and it's litter problem, and how the restrooms smell. To be honest I have never found this to be too much of an issue, and find the criticism unfair - especially after this last week in California! I won't go on too much, but I will say that we noticed more bad smells and litter in Disneyland this week than on any trip to Paris. I say no more. 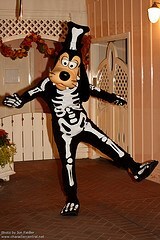 Now I am going to talk about the Mickey's Halloween Parties. 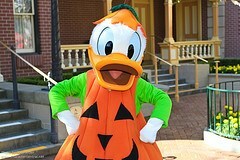 For the past few years we have been visiting Disneyland Paris and WDW for Halloween. Due to this (and other reasons) we had never visited Disneyland California for Halloween before, so this year, we decided we would! 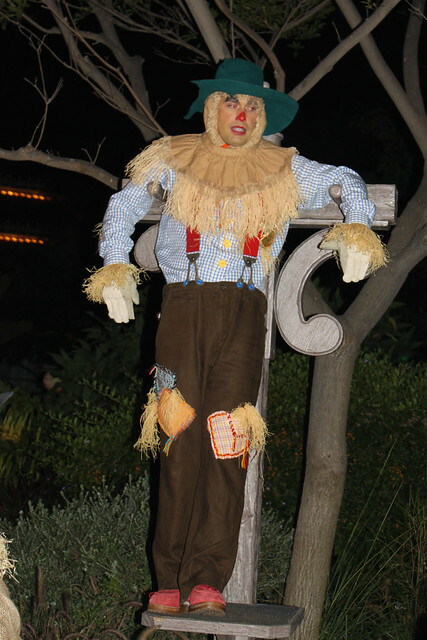 I have already talked about the regular daytime Halloween offerings at Disneyland in part one, so this report is just about the ticketed parties. 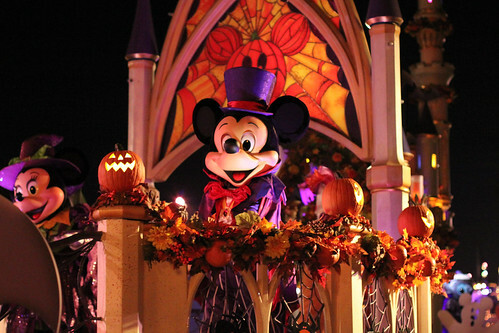 We attended two of the Mickey 's Halloween Parties last week (Tuesday and Friday) and are very glad that we did. 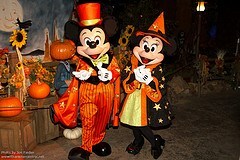 The parties last for five hours and include characters, fireworks, a cavalcade (mini parade), two dance parties and trick or treating. Our first priority on the first party night was to meet Agent P at the Carnation Gardens stage. It became immediately obvious from just standing there waiting that nobody (cast that is) really knew what was going on until the last minute. Eventually they got the line sorted out and we waited for the first set at party start, for Phineas and Ferb, as they switch out with Agent P.
We managed to get them fairly quickly as we had waited before party start time to line up, and then went straight back round in the relatively short line for Agent P's arrival. The line continued to grow, but with a good starting strategy, we had him by 7.30pm. From there we basically went around getting everything done that we could manage. It was incredibly busy, and lines for everything were extremely long. 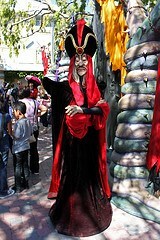 In fact, the trick or treat lines (which we weren't bothered about anyway) were longer that the popular attraction lines. I cannot fathom why people are willing to wait for half an hour at a ticketed event, wasting precious time (and $60) on getting a bag of Skittles of a Milky Way bar! 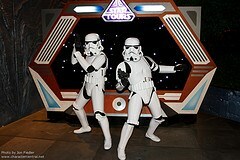 Anyway, as well as Phineas, Ferb and Agent P, we did manage to meet the Stormtroopers, see the Buzz Lightyear dance party (minus Buzz this night! Just the Buzzettes and Green Army Men), the Piratepalooza dance party (all characters present), Winnie the Pooh (he has a new outfit this year) and Tigger and Duffy. We did watch the cavalcade twice, and that also requires some forward thinking. I suggest getting a place at least half an hour before, though it is possible to arrive up to about 20 minutes before, you may not have the best view. The problem with this middle section of the party is that right after the cavalcade you need to then wait for the fireworks, and if you are really interested, right after that the second run of the cavalcade again, it takes up a lot of precious time as you do need to make sure you get good places well beforehand. A tip that we discovered is that if you see the cavalcade on the east side of Central Plaza, you can then basically scoot over to right in front of the Castle and hold out there until the fireworks start. 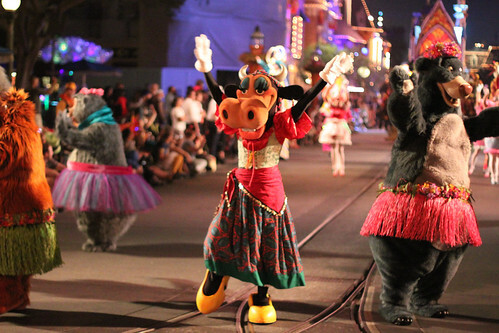 The cavalcade itself is nothing to get too excited about, but is neat to see if you like to see the characters in different costumes, like us. Mickey and the gang are all there, Stitch, the Country Bears, some princesses, a lot of performers (more than I care for - why not just have more characters?! 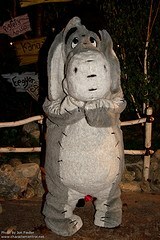 ), Miss Piggy, Baloo and King Louie and a probably a few others I can't recall right now. Overall I liked the cavalcade, but it does need more main floats besides the first and last ones, and the pumpkins, and needs more characters. 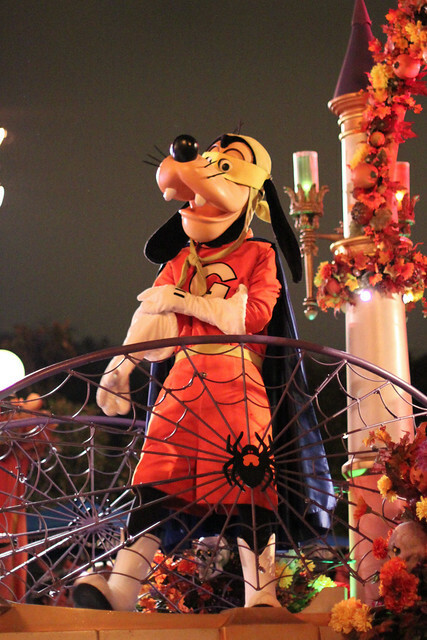 Most of the characters are on the ground, and the best float is the last one with Mickey and friends. Hopefully over time they will build on it, and it will become even better. The fireworks are very neat, and are similar to HalloWishes in the Magic Kingdom. They share a lot of the same soundtrack, except for California they have Jack Skellington narrating through parts of it. There are also a number of other really neat things that these fireworks have over WDW. There is a large balloon that sits to the left of the Castle (hard to explain, but go with it!) that they project things onto. It functions as Jack's head, and also features some other characters though out the presentation. 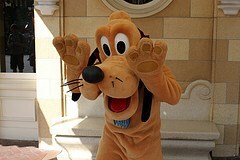 The biggest addition, and the best one is Zero the ghost dog who flies above the Castle! Using the same technique that is used for Tinker Bell during her flights above Disneyland, Zero stars at the beginning of the show, and near the end. It is probably the coolest of the three Castle "fliers" that they have (the other being Dumbo during Magical), and along with the superior fireworks and the Jack head, makes for Disneyland's Halloween fireworks a must see. The dance parties were good if you are into dancing the night away at a ticketed event, but do feature some good characters. 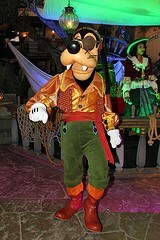 Over in Frontierland there was the Pirate Palooza featuring Donald, Goofy, Pluto, Chip and Dale all dressed in their pirate outfits. 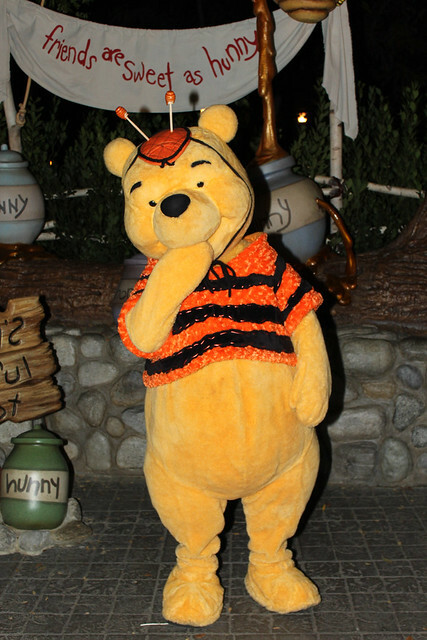 It was never too busy to get an ok picture of them, but as with all the Disney dance parties at any park, if you want your picture with the characters then you need to get in there and dance with them, as they will not stop and pose. In Tomorrowland Buzz, hosts his party, and it also features a number of Green Army Men and the Buzzettes. For some reason, in our multiple attempts to get him, Buzz seemed fairly infrequent at his own party, but after about the fourth time of trying we did find him. 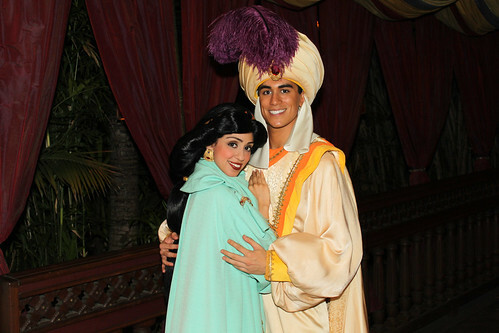 Again, you need to get right in there and dance with the character to have any hope of getting a photo. On the second night, it seemed to be much less crowded, even though it was Friday, and we had much more success with characters. 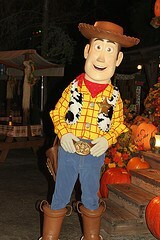 We managed to meet Woody, Jessie, Mickey, Minnie, Agent P (yes, again! 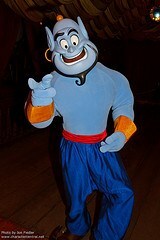 ), Peter, Wendy, Hook, Jack Sparrow, Aladdin, Jasmine, Genie, Pooh, and Eeyore. On all nights (in the two we attended and on hearing from others), the craziest lines were always for Mickey and Minnie, Jack Sparrow and Jack and Sally. 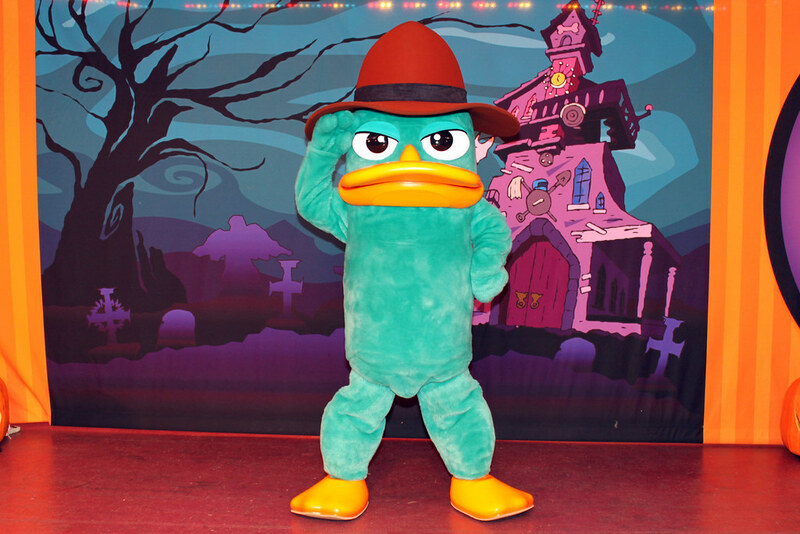 On the second night we knew we wanted to get Mickey and Minnie in their Halloween costumes (they are different to the day time Halloween ones), so like we had for Agent P before, we lined up before the party started to get near the front. It worked well and we were done with them just after 7pm. 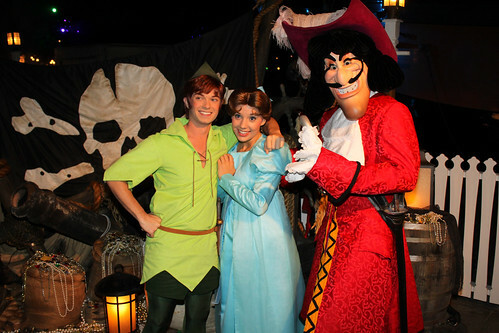 We then went right to the Pirates Wharf area and as the party had just started managed to get Peter Pan, Wendy and Hook. They switch out with Jack Sparrow, so after meeting them we went right back in line again, and when they finished their set, Jack came out. Using this strategy we managed to get Mickey, Minnie, Peter, Wendy, Hook and Jack all within the first forty five minutes of the party! Lines for Woody and Jessie weren't too long the second night so we got those done fairly easily, then managed to meet Eeyore in Critter Country, again because of a shorter line. We did see both cavalcades again, but instead of waiting for the fireworks we decided to use this time to meet some more characters (it was in this time in fact that we got Woody and Jessie). 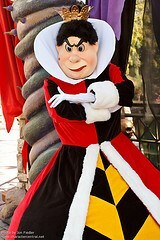 While wandering up thorough Fantasyland the fireworks started, and we knew we might be able to grab of shots of Zero. What was great was that it was fairly quite up there as a lot had been roped off due to the fireworks, and we managed to stand more or less right under where he flies and grab some amazing shots of him overhead! 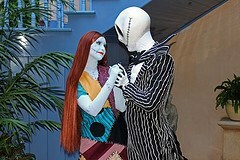 The only characters we did not get to see at the parties were Jack and Sally and the villains as their lines were always insane. We did meet them in the day time in the park though, and they are in the same locations and the same characters so it made no difference. What is strange is that for some reason at the parties their lines were four times as long as in the daytime, and yet they are the same characters! 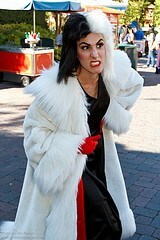 Even at the villains meet they don't bring out anyone special, just the same as always. Again, it makes me wonder why people spend time doing that. 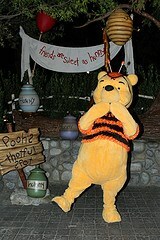 Throughout the park they set up the trick or treat trails, which were always marked by inflatable signs. 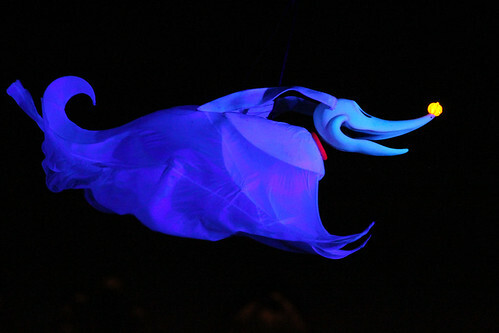 Other things included inflatable ghosts, spooky/Halloween music throughout the park and difference projections and lighting. 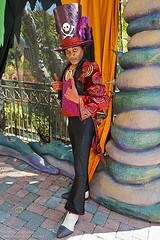 There were also some scarecrows around Central Plaza - real life ones! 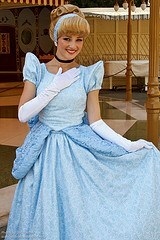 They stood on their posts and would call out to guests and interact with them, usually in a comical way. I thought this was a nice touch and really added something to the randomness and atmosphere of the event. Overall the effects were pretty neat, but maybe could have done with a bit more to really set the mood and create the atmosphere. 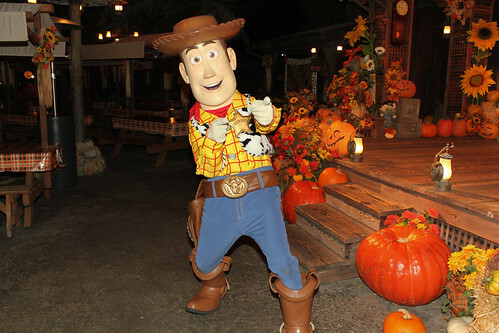 On Wednesday 12th October Jon, Loren and I attended a special annual passholder event at Disneyland Park in California. The idea of it, at least in the beginning, was to get passholders into the park, who don't normally visit so ofter, and to spend money. The idea of having something for "free" (despite having already paying the over inflated AP prices to begin with) was meant to draw people in. And they will be holding more of these events, apparently. Before the event nothing had been said about the event except there would be a special showing of the Soundsational parade, and the chance to meet "some of your favourite Disney Characters". Of course, this is Disneyland, and that could mean anything from just Mickey and Minnie to the whole parade cast (though not likely). I don't want to spend to much time detailing every moment, but what I will say is that it was definitely a unique opportunity to see some of the floats up close, and yes you did get to meet some cool characters, such as the Three Caballeros and Louis the alligator, but, there was a lack of planning and structure that was glaringly obvious. There was nothing except the parade, a special cupcake (which was actually pretty good) and the character meets - and a last minute talk by some imagineers in Tomorrowland - right at the same time as the character meets no less - and nothing else. For a four hour event, everything was crammed into the second two hours, with either too much time to do nothing at the start, or too little time to see all the characters and special talk at the end! Overall we enjoyed the evening, but it felt a little rushed. The best part was getting to meet Panchito and Jose,and Louis!